If referred by a friend or other, please enter name here. Omega Pool Structures, Inc. is the final word in pool and spa enclosures, with a vast portfolio of custom water features and luxury swimming pools to bring you endless possibilities for your commercial swimming pool design and construction project. Omega Pool Structures, Inc. puts the swimming pool of your dreams within your reach. Our residential portfolio is full of elaborately designed custom swimming pools with dramatic multiple levels, beach entrances, vanishing edges and other specialized features. Why do so many architects choose Omega Pool Structures, Inc. to provide expert consultation for custom pool design? Because Omega has mastered the art of controllable aquatic environments, working closely with architects nationwide to provide expertise for all aspects of custom swimming pool design. 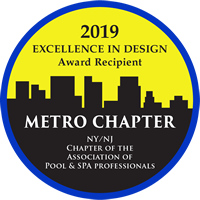 Omega Pool Structures, Inc. has been awarded ASAP's "Excellence in Design" award for 2019.